Best Online SAT coaching in India! Guaranteed point increase. How is the New SAT scored? What is on the New SAT critical reading? What all will be covered in the SAT courses? How does Ivy Aspire help me prepare for my SAT test? 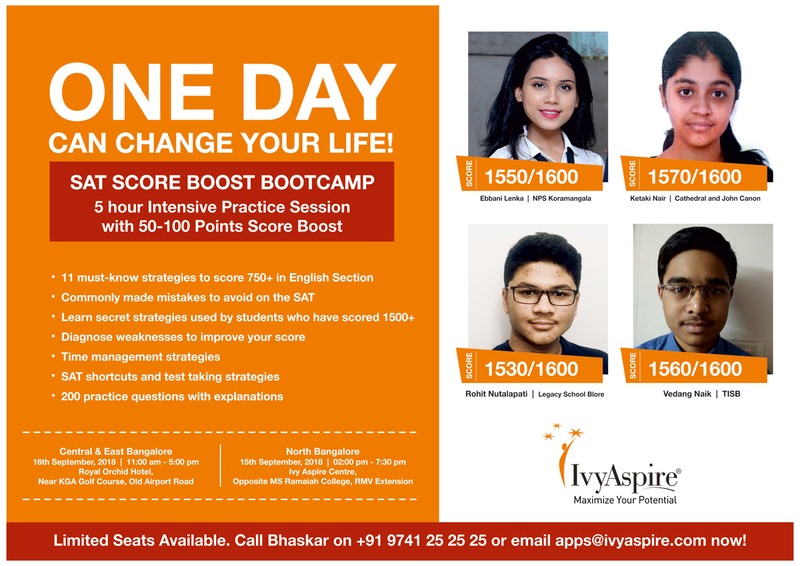 Ivy Aspire’s online SAT classes are available for those who would prefer to learn online without having to visit our centers or are located outside of Mumbai and Bangalore. Our online classes are structured exactly the same way as our classes at our centers and offer the same high quality and score improvement. We follow our innovative 5 steps teaching process supported by an unlimited access to a large variety of resources as well as a mobile app for on the go learning. Step 1: We begin the course with a diagnostic test, based on which we give you a detailed report of your strengths and weakness. We also give you a customized study schedule with pre-class, in-class and post-class work along with all the requisite material (including Ivy Aspire manuals) to help you learn key concepts and familiarize yourself with the exam format and common question types. Conceptual Clarity: We work with you to ensure your basics are strong and that you develop a solid foundation in all SAT concepts enabling you to progress rapidly from solving simpler questions to the more complex ones. This will help you in your schoolwork as well! Practice – We have customized practice questions that help you apply the learning in class to improve your score. Step 3: After we complete a SAT section, we conduct sectional tests to monitor your progress and provide timely feedback and guidance. Step 5: We have special score boosting sessions close to actual SAT exam dates to give your score that final push which could enhance your score by 50-100 points. We promise continued support to our students until they achieve the score that helps them maximize their potential. The Ivy Aspire SAT prep is a 60-hour program which is used for classroom sessions and practice sessions. We mentor student through 15+ full length tests with detailed feedback after the tests. We also support our students for multiple SAT attempts. We review students work constantly and each student receives a fully customized plan to help him or her work on weaknesses and convert them to strengths. The SAT is only one component of your college application – your high school GPA, academic transcripts, letters of recommendation, extracurricular activities, essays and interviews contribute significantly to your application. We help students not only with the SAT prep but also with the entire gamut of application activities that one has to undertake for a successful college application. CALL OR E-MAIL US FOR DETAILS ABOUT OUR ONLINE CLASSES.